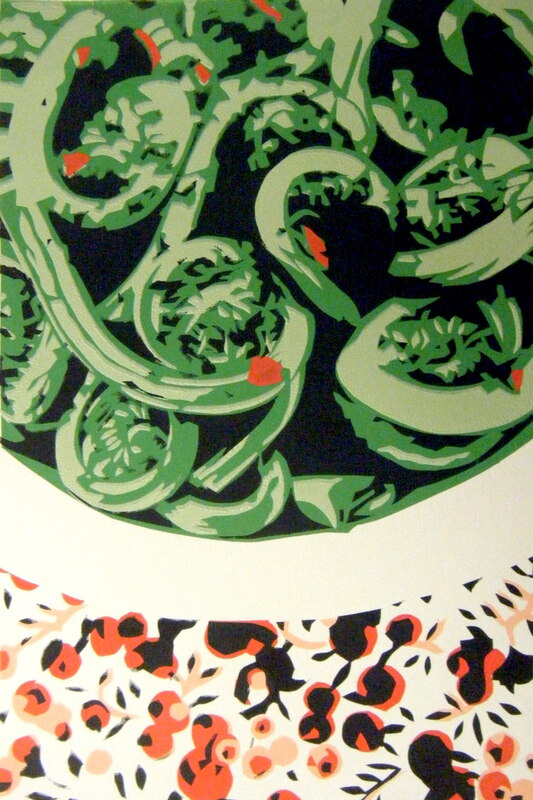 This is a silkscreen based on a photo of sautéed fiddleheads, a New England spring culinary treat, done for my son Henry’s school. They are having a “Foodie Fundraiser” and my work will be the part of the VIP bonus package. It is not like my usual work but a style developed in a lesson I do with my 8th graders. Start with a photo. Ramp up the contrast. Then print out several copies. Each copy becomes a hand-cut paper stencil: one per color. The stencils are then used with a silkscreen and ink to print multiple layers on the same paper. Fun. If you want to see the results of my students’ work, check it out here.